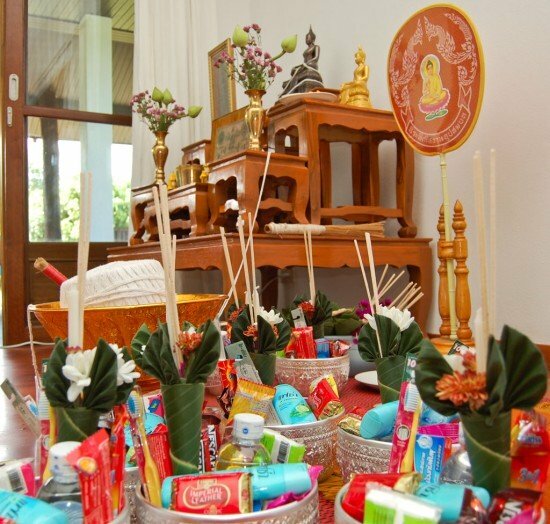 Khuan Ban Mai (ขึ้นบ้านใหม่), the blessing of a new house, is regarded by Thai people as a very auspicious event. It celebrates the completion of a new home by bringing together friends and family and performing a Buddhist rite to encourage good fortune and prosperity for the new dwelling and its inhabitants. 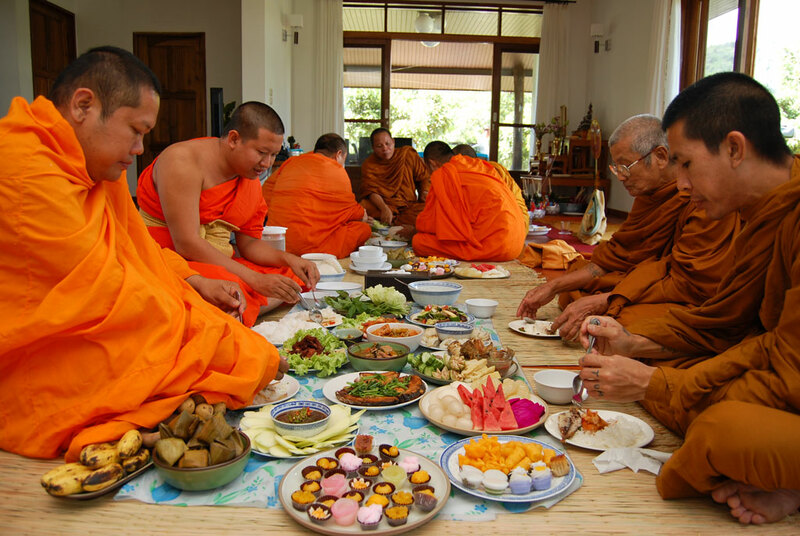 When the ceremony is finished, food will be offered to the monks by the host followed by gift offerings. The gift set usually contains a banana leaf cone holding flowers, candles, and joss sticks along with necessary everyday items (drinking water, soap, detergent, toothbrush, shampoo and comestibles such as biscuits or crackers). As well as these individual gifts for monks there is usually a sealed envelop which contains a donation to help support the temple. As part of the ceremony, monks will sprinkle holy water on the host and guests and throughout the new house. 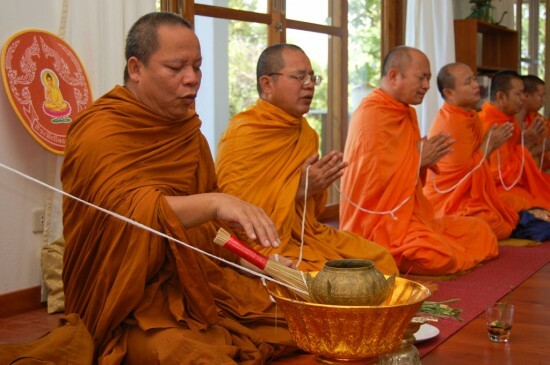 Each member of new household will receive a string wrist-binding (white holy thread) from the monk as a blessing. The holy thread, known as Sai Seen, is also entwined around the main household Buddha image. Once blessing is complete the monks leave and the guests will have lunch together. Khuan Ban Mai, the housewarming ceremony is a traditional part of Thai life that has been passed from generation to generation. 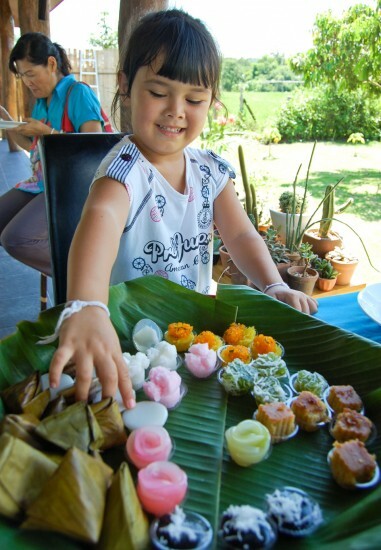 It is a ceremony combining Buddhist beliefs with social values and Thai customs and is a wonderful opportunity for family members to gather and enjoy the moment together increasing warmth and closeness in the family and with friends. Thai people normally do not bring alcohol or wine like Westerners. Usually Thai people put some money in envelope and give to the host with the idea that hosts have to pay for many things to set up a housewarming ceremony, so it’s nice to help supporting them. 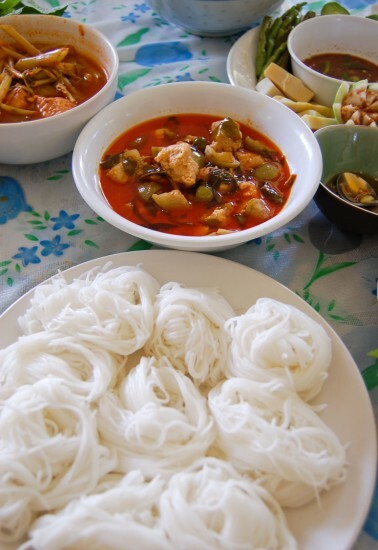 But if this seems strange for foreigners to give money to the host, then it is ok to bring “kanom” – Thai sweet snacks like this http://www.templeofthai.com/food/asian_snacks/almond-cookies-with-cashew-nut-3110000527.php – Enjoy!